Pittwater Butterfly Notes: for those seeing wings flitting + Inspirations to find your own species - some do! Many may have seen those brilliant blue triangle butterflies flitting around Pittwater in recent weeks. The Blue Triangle Butterfly - Graphium sarpedon choredon, is just one of around 400 butterflies seen in Australia with a dozen endemic species and even some of the world's largest found only here. The Cairns birdwing butterfly wingspan can be up to 15 cm (5.9 in) in females, and 12.5 cm (4.9 in) in males. A closely allied species, the New Guinea or Priam's birdwing (Ornithoptera priamus) reaches 19 cm (7.5 in) and is the largest butterfly species found in Australia, but it is not endemic. Australia butterflies come from seven families: Papilionidae: swallowtails, Nymphalidae: brush– or four-footed, Pieridae: whites and yellows, Coliadinae: yellows, Riodinidae: metalmarks, Lycaenidae: gossamer-winged blues and coppers, and Hesperiidae: skippers. September through April is when see the most butterflies through Sydney, although some are spotted during the cooler months of May and June as well. There is a great webpage hosted here which lists many of the butterflies you will see in Sydney. The Blue Triangle Butterfly, like the Cairns birdwing, are Swallowtail butterflies - the large, colorful butterflies in the family Papilionidae, and include over 550 species. Though the majority are tropical, members of the family inhabit every continent except Antarctica. When researchers studied the eyes of Common Bluebottles, a species of swallowtail butterfly from Australasia, they were in for a surprise. These butterflies have large eyes and use their blue-green iridescent wings for visual communication -- evidence that their vision must be excellent. Even so, no-one expected to find that Common Bluebottles (Graphium sarpedon) have at least 15 different classes of "photoreceptors" -- light-detecting cells comparable to the rods and cones in the human eye. Previously, no insect was known to have more than nine. "We have studied color vision in many insects for many years, and we knew that the number of photoreceptors varies greatly from species to species. But this discovery of 15 classes in one eye was really stunning," says Kentaro Arikawa, Professor of Biology at Sokendai (the Graduate University for Advanced Studies), Hayama, Japan and lead author of the study. Have multiple classes of photoreceptors is indispensable for seeing color. Each class is stimulated by light of some wavelengths, and less or not at all by other wavelengths. By comparing information received from the different photoreceptor classes, the brain is able to distinguish colors. Through physiological, anatomical and molecular experiments, Arikawa and colleagues were able to determine that Common Bluebottles have 15 photoreceptor classes, one stimulated by ultraviolet light, another by violet, three stimulated by slightly different blue lights, one by blue-green, four by green lights, and five by red lights. Why do Common Bluebottles need so many classes of photoreceptor? After all, many other insects have only three classes of photoreceptor and yet have excellent color vision. Likewise, humans have only three classes of cones, enough to distinguish millions of colors. Arikawa and his colleagues believe that Common Bluebottles use only four classes of photoreceptor for routine color vision, and use the other eleven to detect very specific stimuli in the environment, for example fast-moving objects against the sky or colorful objects hidden among vegetation. A similar system is found in another butterfly previously studied by the same research group, the Asian swallowtail Papilio xuthus, which has six photoreceptors. "Butterflies may have a slightly lower visual acuity than ourselves, but in many respects they enjoy a clear advantage over us: they have a very large visual field, a superior ability to pursue fast-moving objects and can even distinguish ultraviolet and polarized light. Isn't it fascinating to imagine how these butterflies see their world?" says Arikawa. 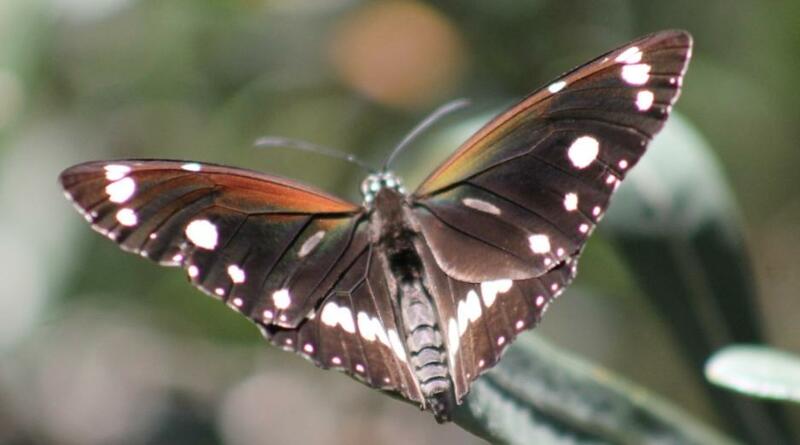 Another swallowtail that visits Sydney from October to May is the Papilio aegeus, the orchard swallowtail butterfly or large citrus butterfly. Both male and female have black forewings with a white stripe, though there is more white overall on the female forewing. The hindwing is again black, and there is a white swath through the middle. Here the markings differ in that the female has chains of red to orange and blue crescents toward the edge. The markings on the underside are similar to those on top. The body is black. The wingspan is about 140 millimetres (5.5 in) in females and 120 millimetres (4.7 in) in males, making it rather large overall and the largest butterfly commonly seen in at least part of its range. Despite being a swallowtail, which group derives its name from the distinctive tails on the hindwing, this characteristic is entirely absent. A spectacular new butterfly species has been discovered on the Pacific Island of Vanua Levu in Fiji. The species, named last week as Papilio natewa after the Natewa Peninsula where it was found, is a remarkable discovery in a location where butterfly wildlife was thought to be well known. The large Swallowtail was first photographed in 2017 by Australian ornithologist Greg Kerr, working with Operation Wallacea, an international organisation which supports school students in science projects. Specialists around the world were puzzled when Kerr's photograph was sent for identification. It was not until earlier this year, during a second fieldtrip to Fiji, that it was confirmed as a species new to science by John Tennent, Honorary Associate at Oxford University Museum of Natural History, and Scientific Associate of the Natural History Museum, London. 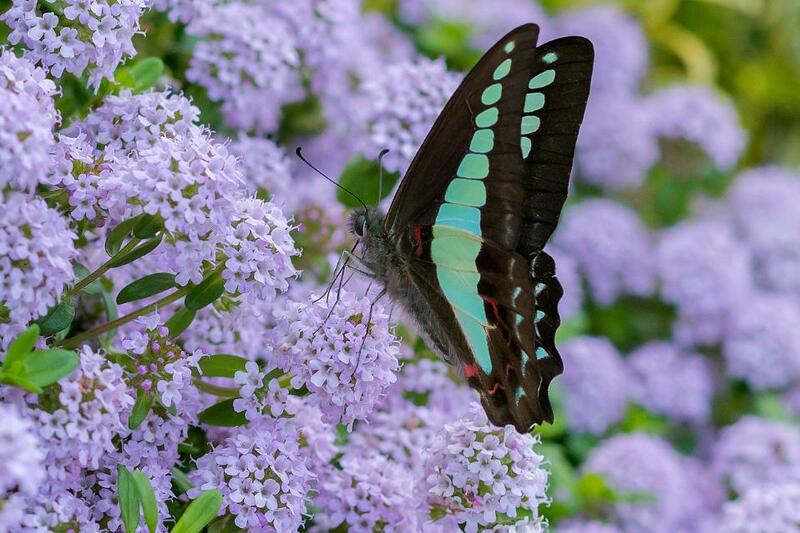 "For such an unusual and large new butterfly to be discovered somewhere we thought was so well known is remarkable," said John Tennant, who is a Pacific butterfly specialist. The species was named by Tennant and colleagues in Fiji and Australia in a paper published this month in Entomologischer Verein Apollo. Tennant has spent long periods in the Pacific, including the Solomon Islands and eastern Papua New Guinea and has found and named over a hundred new species and subspecies of butterflies in the last 25 years. But he describes the new Natewa Swallowtail as "easily the most spectacular." The find is especially remarkable because there are only two Swallowtail butterfly species previously known from this part of the Pacific, and only one from Fiji. "Because they are large, conspicuous and often beautiful in appearance, Swallowtail butterflies have been intensively studied for over 150 years," says James Hogan, manager of butterfly (Lepidoptera) collections at Oxford University Museum of Natural History. "To find a new species like this, not only in a small and reasonably well-studied area like Fiji, but also one which looks unlike any other Swallowtail is truly exceptional. For John Tennent, Greg Kerr and the rest of the team this really is a once-in-a-lifetime discovery." The Natewa Swallowtail has remained undiscovered for so long perhaps due to its habits and the geological history of the islands. Unusually for a Swallowtail, it seems to be a true forest species, spending most of its life inside the forest at elevations above 250 metres, on land with restrict access rights. "It does make you wonder what else awaits discovery in the world's wild places. The key to finding new and interesting things is simply to go and look," adds Tennant. The large Swallowtail, now named Papilio natewa, was first photographed in 2017 by Australian ornithologist Greg Kerr, working with Operation Wallacea. Papilio natewa was one of four new species of butterflies discovered or named in 2018; the Cyllopsis tomemmeli in Mexico, named for Thomas Emmel, now 76 and an internationally recognised Lepidoptera expert at the University of Florida, who went on his first expedition at age 17, Wahydra graslieae, named to honour Emily Graslie the Field Museum in Chicago's chief curiosity correspondent, and Catasticta sibyllae, named for Maria Sibylla Merian an artist who sailed across the Atlantic on a largely self-funded scientific expedition to document the animals and plants of Dutch Suriname in 1699. The Acentria's fritillary seems to be endemic in northern Israel and the neighbouring territories of Syria and Lebanon. Its evolutionary history is likely to prove interesting. "The species is probably one of a handful of butterflies known to have arisen through hybridisation between two other species in the past," says Lukhtanov. "This process is known to be common in plants, but scientists have only recently realised it might also be present in butterflies." This is the first new butterfly species discovered and described from the territory of Israel in 109 years. A perusal of science articles shows that new species of Butterflies are always being discovered - and well worth keeping an eye out for. Another butterfly specific to here is the Australian painted lady (Vanessa kershawi) butterfly is mostly confined to Australia, although westerly winds have dispersed it to islands east of Australia, including New Zealand. Some debate surrounds the taxonomy of this species. Some believe that the Australian painted lady should be a subspecies of the painted lady (Vanessa cardui) due to the similarity in lifestyle and behaviour. Furthermore, the painted lady is found around the globe, but Australia is the only location in which it varies enough to be considered a separate species. This can be seen around Sydney at any time except Winter. The Australian painted lady belongs to the family Nymphalidae and genus Vanessa, which compromises 22 species, which are strongly migratory. During spring, adult butterflies migrate south in large numbers from northern states of Queensland and New South Wales. To find mates, male Australian painted ladies exhibit territorial behaviour, which involves a male perching on vegetation in a sunny spot on a hilltop, waiting for females to fly by. Despite urbanisation and invasive plants altering its habitat, populations of Australian painted ladies have not been significantly impacted by these changes. The life cycle of the Australian painted lady lasts around 53 days in the summer. The females lay eggs in the centre of the leaf of food plants. The eggs are green and hatch in about three days. As a caterpillar, the Australian painted lady is only active at night, during which its main activity is feeding. During the day, it hides in a curled leaf or at the foot of a food plant. The pupa hangs vertically from the underside of the leaf of a food plant, and the duration of the pupal stage is about two weeks. The Australian painted lady typically uses the native Australian everlastings and other daisies as a host and food plant. However, it also feeds on several introduced species, including capeweed (Arctotheca calendula), Scotch thistle (Onopordum acanthium), and lavender (Lavandula angustifolia). The adults feed on the nectar of flowers. 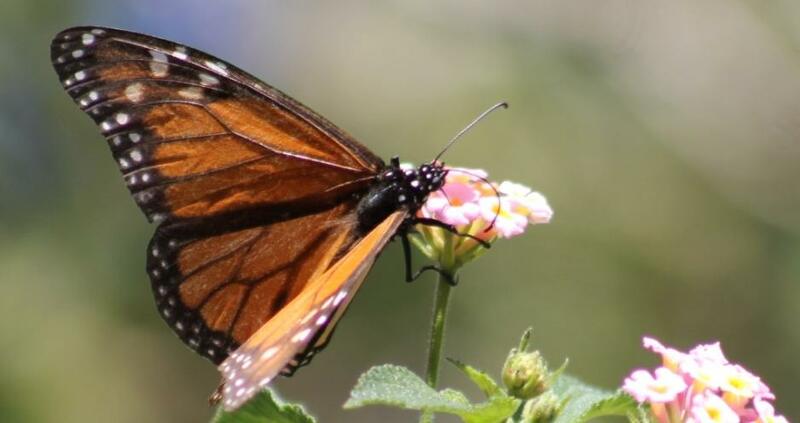 Another in the Nymphalidae family, which can be seen in Sydney at just about anytime and anywhere, is the Monarch butterfly or simply Wanderer (Danaus plexippus). These live for around four months and spend pretty much all of that time doing what their name describes - wandering! The name "monarch" is believed to be given in honour of King William III of England, whose secondary title Prince of Orange makes a reference to the butterfly's main colour. The monarch was originally described by Carl Linnaeus in his Systema Naturae of 1758 and placed in the genus Papilio. In 1780, Jan Krzysztof Kluk used the monarch as the type species for a new genus Danaus. Robert Michael Pyle suggested Danaus is a masculine version of Danaë, Danaus's great-great-granddaughter, to whom Zeus came as a shower of gold, which seemed to him a more appropriate source for the name of this butterfly. 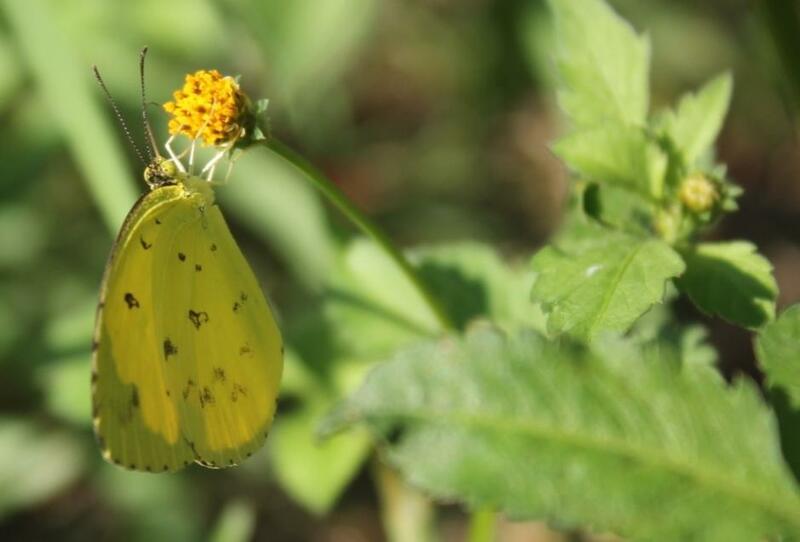 Among the Pieridae family we can see Eurema brigitta from December to April, usually staying low to the ground. The Pieridae are a large family of butterflies with about 76 genera containing about 1,100 species, mostly from tropical Africa and tropical Asia with some varieties in the more northern regions of North America. Most pierid butterflies are white, yellow, or orange in coloration, often with black spots. The pigments that give the distinct coloring to these butterflies are derived from waste products in the body and are a characteristic of this family. The name "butterfly" is believed to have originated from a member of this family, the brimstone, Gonepteryx rhamni, which was called the "butter-coloured fly" by early British naturalists. Eurema brigitta has a wingspan is 30–35 mm. Another in the same family Pieridae you may see almost year round is the introduced Pieris rapae, the small white, is a small to medium-sized butterfly species of the whites-and-yellows family Pieridae. It is also known as the small cabbage white and in New Zealand, simply as white butterfly. 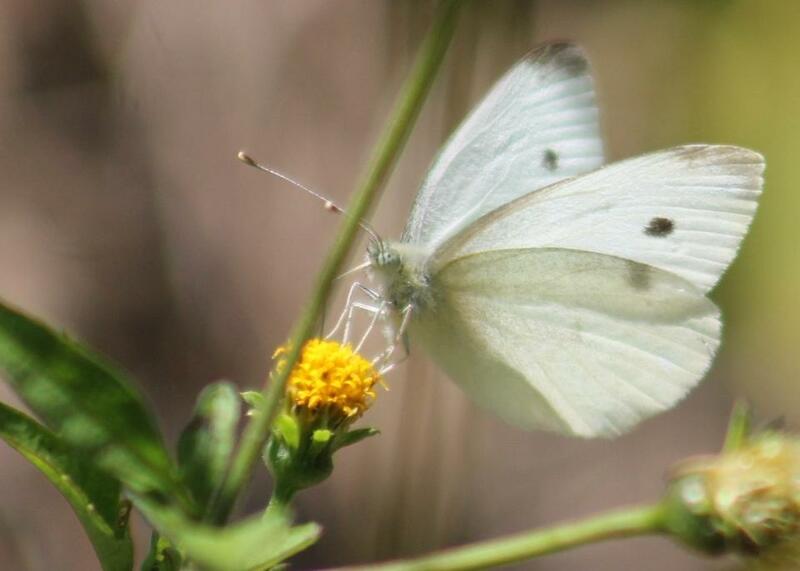 The names "cabbage butterfly" and "cabbage white" can also refer to the large white. The butterfly can be distinguished by the white colour with small black dots on its wings. They are further distinguished by the smaller size and lack of the black band at the tip of their forewings. It is widespread and is believed to have originated in Europe or Asia. It is also found in North Africa and was accidentally introduced to North America, Bermuda, Australia and New Zealand. The caterpillar of this species is seen as a pest for commercial agriculture. Often referred to as the "imported cabbageworm" they are a serious pest to cabbage and other mustard family crops. So for those who ascribe to Shakespeares' line from Hamlet - There are more things in heaven and earth, Horatio, than are dreamt of in your philosophy - have a closer look next time you see something colourful flitting by - you may be the first to do so.